As if waking up and getting dressed wasn’t hard enough, suddenly you’ve finished uni and have to wake up and get dressed for work. We feel your pain and so do OPSM, so we’ve teamed up with them to bring you the easiest ways to look the part in whatever career field you get your hard earned cash from. Living the corporate life (aka suit life) can be hard. Don’t let the rigid ways of ill-fitting skirts and monochrome everything get you down though. You can show off your personality minus any judgey eyes from the receptionist. Opt for a pop of colour and any kind of interesting skirt (think pleats, silk or prints) and own it. Don’t forget your totally fashion forward specs so you look as smart as we already know you are (it works, trust us)! Go full #girlboss and show your staff just who is in charge with a killer outfit that looks like you actually tried. The best part? You don’t actually have to try because all you need is a luxe AF handbag, good hair and designer glasses. What’s that saying? A little bit of money goes a long way… Remember, they pay you the big bucks for a reason. Everyone knows it’s alllll about first impressions and there’s no denying you need to make a good one when you’re an inern. Denim jeans and a leather jacket are a failsafe. No, we’re not kidding, and yes, it really is that easy. Make sure they’re clean (maybe even wash them?) and always brush you hair, then it’s up to you to go get ‘em tiger! Ohhhh that freelancer life. We’re oh-so-jealous that you have the option to stay in bed all day in your pyjamas, be your own boss, and do whatever the hell you want. But for those odd days you have a meeting IRL, or actually have to go out in public, you need to look the part. 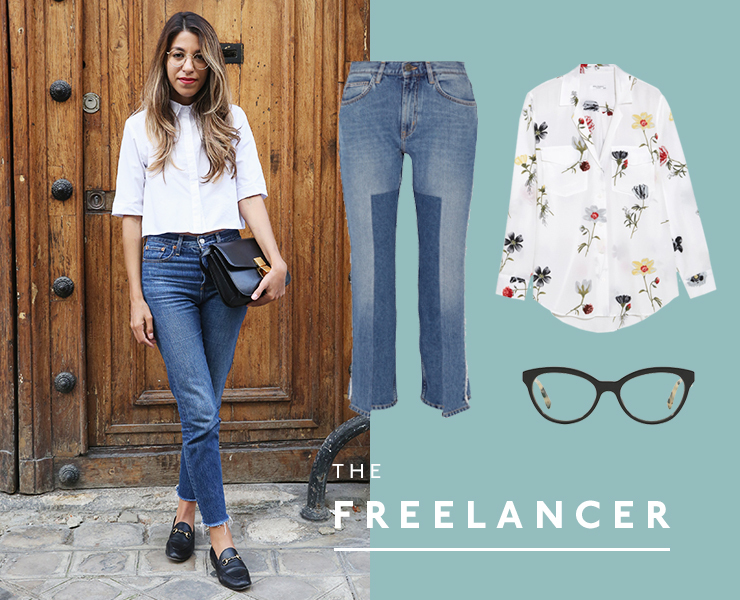 Steal your mum’s best silk button up, add some sleek glasses and be on your way. Creatives really do have it all. Not only do you get to have fun, all day, errryday, you get to wear fun clothes to work too. Whilst we agree that anything goes, stay colourful and bright (black is boring, duh) and make sure you take advantage of the fact that there are no rules.